Welcome to the Historic Christian Church! We are delighted to have visitors worship with us, and we pray that you will be blessed through your participation with us. You don't have to be Greek to belong to the Orthodox Church. The word "Greek" in "Greek Orthodox" (you can substitute "Russian," "Romanian," "Serbian," etc) refers to the immigrants who brought their Orthodox Faith to this area and to the jurisdiction to which we belong (the Greek Orthodox Archdiocese). Our services are mostly in English (about 90%). 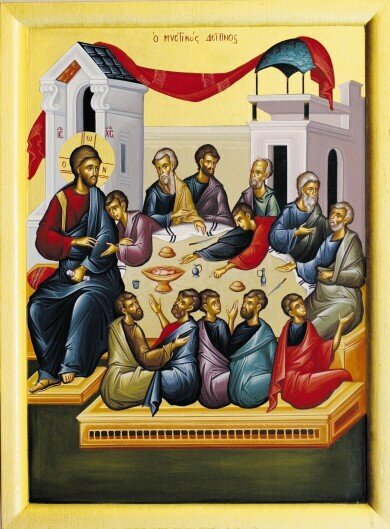 In the Orthodox Church, the reception of Holy Communion is a mark of membership in the Church. Only those who have been united to the Orthodox Church through Baptism or Chrismation, and have prepared themselves through regular Confession, prayer and fasting are permitted to partake of Holy Communion. We encourage visitors to participate in our prayers and hymns and to approach at the end of the Divine Liturgy to receive the "Antidoron," the blessed bread that is distributed at the very end of the Divine Liturgy. This is not Holy Communion, but is blessed bread given "...instead of the Gifts." Literature about the Orthodox faith and this parish can be found in the Narthex (vestibule). Please feel free to ask questions before or after the service, as well as to join us downstairs for coffee fellowship immediately following the Divine Liturgy. If you desire to serve in His vineyard, contact OCMC to experience your faith in a new and meaningful way. Team applications and details are available at www.ocmc.org or call the OCMC at 1.877.463.6787 (ext 142) for more information.